Synology SHR (Synology Hybrid RAID) RAID is a RAID layout used in modern Synology NASes. 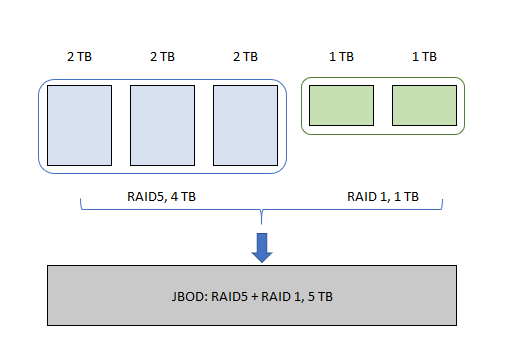 The main difference from a traditional RAID is that the SHR technology allows to effectively combine disks of different sizes into a redundant single storage. Also, with SHR, you can easily replace some or all the disks with larger ones thus enlarging the NAS in the way you want. You can think of the SHR layout as a JBOD consisting of several traditional RAIDs (typically they are RAID1 and RAID5). At the disk level, combining disk areas into traditional RAIDs are done by means of the Linux md-RAID technology while a JBOD over them are created using the LVM technology. If LVM metadata is correct, you need to use any data recovery software which is capable of parsing LVM records. Our ReclaiMe File Recovery (www.ReclaiMe.com) can do that – you just connect all the available Synology disks to a PC running Windows, launch ReclaiMe and wait till the software completes scanning Linux md-RAID and LVM metadata at start. Then look for your Synology volumes in the list of available devices in ReclaiMe and start filesystem recovery to get files and folders. In case of lost or incorrect metadata the course of actions depends on a particular SHR layout you deal with. SHR was created over disks of the same size. In this case you have a traditional RAID rather than a JBOD and can use a typical RAID recovery approach – first launch data recovery software which is cable of reading md-RAID layout (ReclaiMe File Recovery can do that) and look for your Synology volume among the md-RAID volumes paying attention to the size which should be about the size of the Synology volume. Typically it is a RAID5. If you do not see the appropriate md-RAID volume or file recovery on doesn’t bring correct files and folders, most likely md-RAID metadata is damaged and you need to reconstruct RAID configuration first – use any RAID recovery software like ReclaiMe Free RAID Recovery (www.FreeRAIDRecovery.com) to reconstruct RAID and then launch filesystem recovery on the reconstructed RAID using any data recovery software like ReclaiMe File Recovery. SHR was created over disks of different sizes. In this case you can relatively easy get data only from a first RAID member in the JBOD. To get data in full you have to manually reassemble RAIDs into a JBOD which is not that easy at all and requires more powerful software and extensive knowledge and experience.